Minimize clutter and position your USB 3.0 Micro devices near your desktop or laptop computer easily, with a thin, flexible cable. Does your regular USB 3.0 cable lift or push against your external hard drive causing it to move around on your desk? Are you forced to arrange your desk according to how your cable decides to bend and rest?The USB3AUB50CMS features a slim USB wire construction that makes it easier to install your USB 3.0 devices and enables you to place them as needed throughout your workspace. Plus, the thin Micro USB connector molding makes this a great cable for mobile USB 3.0 devices too - it lets you plug into your device without having to take it out of its case for every charge and sync.Organize your desk and your office to match your needs. This durable, lightweight cable is approximately half the thickness of a regular USB 3.0 cable giving you the freedom to place your devices as needed and with minimal clutter. The flexible, thin cable also reduces strain on the connection and prevents damage to the USB 3.0 port on your device.Plus, the short 0.5m/1.5-foot cable length makes this an excellent solution for close-range connections and portable applications (e.g. connecting a portable hard drive to your laptop).Charge your mobile device in your car or sync with your laptop.As well as being ideal for connecting to your desktop devices, this cable provides the perfect solution for charging and syncing your USB 3.0 Micro B-equipped phones and tablets.The short cable design is just right for people on the move, for providing simple, tidy connections and it fits nicely inside your laptop or tablet carrying case.Stop removing the case from your phone or tablet every time you charge or sync your device. The cable offers a thin Micro USB connector molding that plugs into your device even while it's inside a protective case. 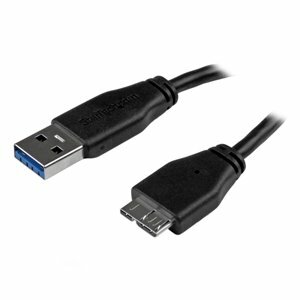 This durable, lightweight cable features a slim USB wire construction - approximately half the thickness of a regular USB 3.0 cable, which offers a more flexible installation with minimal clutter - great for positioning an external hard drive or other USB 3.0 device as needed on your desktop or anywhere else in the office. The Micro USB connector molding has been redesigned to be much thinner than other cables in the market for providing simple, easy connections.